The Nolichucky River, also known as the “Noli” or “Chuck” is approximately 115 miles of freestone river flowing from Western North Carolina’s peaks all the way down through Erwin Tennessee. It’s watershed comes from the coldest water in the region and approximately 72 miles are protected under the Wild and Scenic Rivers Act. The Nolichucky river is home to a large population of smallmouth, big trout and plenty of native red-horse or red-tails. Fishing the Noli is exciting all year round. The best times to book your guided fishing trip on this gorgeous river is March through early November. Early spring offer anglers with finesse fishing techniques including light line and small grubs, tubes and hair jigs. Late spring smallmouth will rise into shallower runs and pools in search for crawfish and sculpins. Many bigger fish are caught in late spring during pre-spawn months as well as May, June and July. Smallmouth feed all summer long on baitfish, crawfish and other bugs so there are many techniques that work during the summer. Throughout the summer smallmouth can be found searching for fallen mayflies, injured baitfish, frogs crossing the river and rodents during nightfall. Popular baits are baitfish pattern soft plastics, tubes, grubs, hair jigs, frogs and many topwater baits during late evening and early morning. During the months of Autumn, our smallmouth guides will teach a specialized pattern chasing bait and how to catch the biggest smallmouth in the school. From October through November, smallmouth will school up and run in packs. They will chase baitfish for two months, filling up for the colder months approaching. These fish are aggressive and willing to take larger sized baits. If you’re looking for an unforgettable smallmouth fishing trip, look no further. 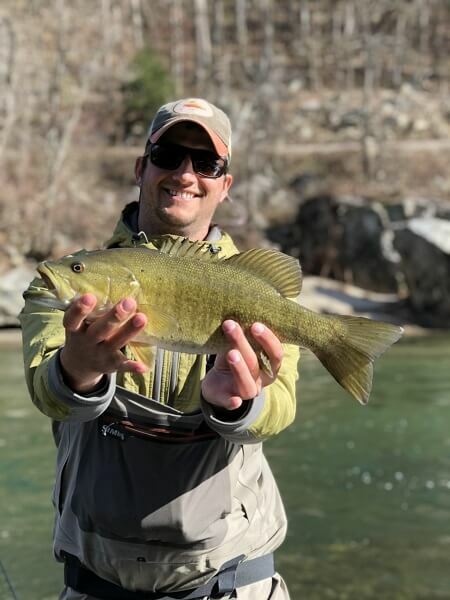 Our professional guides will not only put you on fish, but are excited to teach smallmouth bass fishing techniques while on your guided fishing trip.